This is a book about a man. It's laid out like a crime novel with the detectives hunting a serial killer, but mostly it's just about that one man. It's about that man and his quest for redemption. Frank Parrish has just returned to work in the homicide division of New York's finest following an incident in which his partner died. He's a man living in the shadow of his past, most recently of the incident in which his partner was killed, but primarily in the shadow of his father. Frank's father is held up to all as the shining light of the New York Police Department. He is lauded as a hero for the way in which he fought injustice back in his day. Frank knows better. He knows his father was corrupt, a crooked cop who took bribes and sold information to the Mafia. A lot of this book is about how Frank deals with how his father, now dead, is hero-worshipped in the force, when he knows it's all a lie. The relationships Frank manages to sustain – with his therapist, his ex-wife, his daughter and with alcohol are all defined by his need come to terms with what his father was, to stop trying to live up to the man that his father should have been, but wasn't. 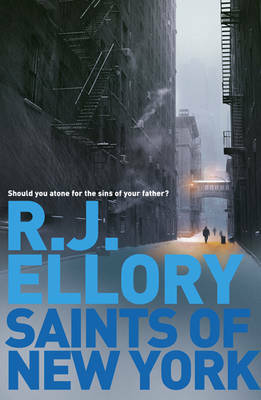 Frank Parrish could have been a cliche - the washed-up, alcoholic homicide detective, but Ellory writes so well that he gets away with it. Frank Parrish is a character that draws you in to his chaotic world and makes you want to believe in him. Plot-wise the book is an interesting one. Frank thinks he's uncovered the work of a serial killer, when he spots a link between a couple of apparently unrelated cases. Someone is killing young girls in the city, and the deeper Frank delves the more bodies he uncovers. If he's right then this has been going on for years. Trouble is - no-one else can see the connections. No-one has enough trust left in Frank, enough faith to believe his instincts. And if no-one will believe him, how can he stop the killer? Ellory is shaping up to be an exceptionally fine writer. He seems to get better and better with each book, and he continues to come up with great characters, characters you can invest it. He writes a good plot too, keeping the tension up right to the end. There's really not a whole lot more you can ask of a writer. Great stuff.